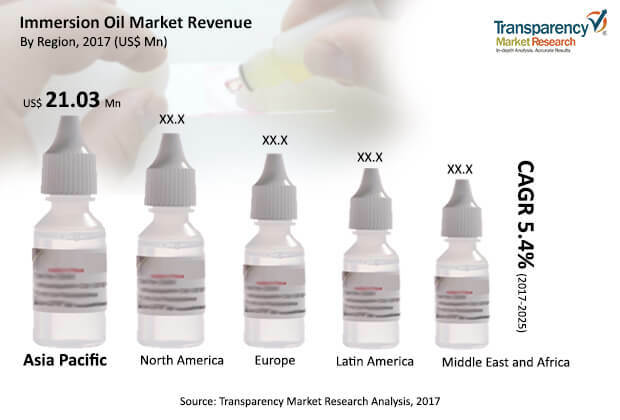 The global immersion oil market was valued at around US$ 55 Mn in 2016 and is anticipated to expand at a CAGR of more than 5% from 2017 to 2025, according to a new report published by Transparency Market Research (TMR) titled ‘Immersion Oil – Global Industry Analysis, Size, Share, Growth, Trends, and Forecast, 2017–2025.’ Expansion of the global immersion oil market is driven by the rise in demand from diagnostics laboratories and pharmaceutical & biotechnology companies. The immersion oil market in Asia Pacific is expected to expand at a CAGR of more than 6% during the forecast period. Innovations in microscopy sciences and the rise in usage of microscopes in life science and the health care industry are likely to propel the immersion oil market in the region. Rise in the usage of the microscopes in the life sciences and health care industries are likely to propel the immersion oil market. Presently, various researches are being carried out mostly in the field of cell biology and histology. Rapid developments such as improvements in sample labelling, contrast, illumination, resolution, signal detection, and data processing have occurred at all stages of microscopy experiments and are expected to significantly boost the market. However, very small number of research studies carried out on immersion oils, individually, is likely to hamper the immersion oil market. Based on type, the immersion oil market can be segmented into paraffin oil, cedar wood oil, synthetic oil, and others. Synthetic oil has possesses numerous properties in comparison to other oils, such as it has high temperature resistance and it does not change its color with age. Synthetic oil segment is anticipated to hold a major share of the immersion oil market, as it is replacing the traditionally used cedar wood oil. Synthetic oil is widely used in normal light microscopy and for the elevated temperatures due to its properties mentioned above. Developing countries such as China, India, and Japan are expected to witness an increase the usage of synthetic oil, leading to increase in its demand. In terms of application, the immersion oil market can be divided into normal light microscopy, automated hematology system, inverted, inclined, projection, and long focus instruments, fluorescence microscopy, elevated temperatures, and others. The normal light microscopy segment is anticipated to dominate the market during the forecast period. The normal light microscope employs visible light to detect small objects that are not visible to the naked eye. Usage of immersion oil for the microscope provides a clearer picture of the object, offering a finer resolution and brighter image of the object. A normal light microscope is mostly employed by various end-use industries such as hospitals & clinics, academic & research institutes, diagnostic laboratories, pharmaceutical & biotechnology companies, and others. In terms of region, the global Immersion oil market can be categorized into North America, Europe, Asia Pacific, Latin America, and Middle East & Africa. North America and Europe accounted for a prominent share of the Immersion oil market, as most pharmaceutical & biotechnology companies are well-established in these regions. The market in Asia Pacific is estimated to expand at a rapid pace due to rapid development in microscopy science and the research activity in developing economies such as China and India. The market in Middle East & Africa and Latin America is expected to expand at a sluggish pace during the forecast period. Key players operating in the immersion oil market include Cargille Labs, EMD Millipore Corporation, Flinn Scientific, Thermo Fisher Scientific, Azzota Corporation, Nikon Instruments INC., Honeywell International Inc., Leica Microsystems, Olympus Corporation, and Idemitsu Kosan Co., Ltd. Companies are investing heavily in the development of microscope immersion oil. For instance, Cargille Laboratories, Inc. invested in the development of its microscope immersion oil, Type NHV, which is utilized for inverted, inclined, projection, and long focus instruments. Leica Microsystem launched SP8 DIVE system, the world’s first spectrally tunable solution for multi-color, multiphoton deep tissue imaging.